looks like limestone so i am very stumped! north america maybe? Similar type of rock, but further south. Negative. Also volcanic rock but a fair way east... Not a major destination so might be tricky, though pretty sure I've seen it mentioned here before. City of Rocks? Wild Iris? Looks like the Chris Plant 5.13a - but can't remember the name! Correct - The Enchanted Tower in New Mexico. The route is a 5.13a called Goliath that takes the arete all the way. nice one! i think i like this game. 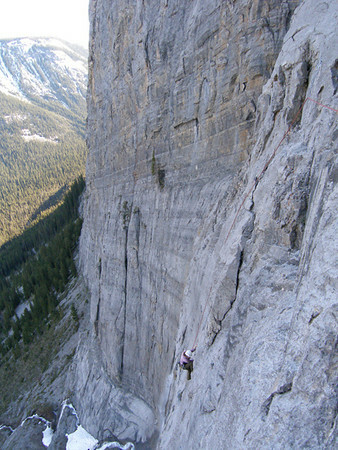 The Enchanted Tower is a huge Pinnacle with a dozen or so routes all, super long pumpers. Lowering off involved stopping at midway anchors where you need to rethread to make the ground. Other routes exist on smaller outcrops that litter the valley, but the tower is the feature! No idea but cool photo. When guessed can you give a micro trip report of the route? yeah I thought the Canada part would have been obvious, not the Bugs though.